There are hill towns in Tuscany where life goes on as it always has, where few tourists yet venture. Yet this Tuscany enchants as much as the other and maybe more? A ‘hill town’ describes many medieval settlements. High ground was natural refuge in wartime. Italians built towns in the most unlikely of high places. Driving up their winding access roads, I still wonder how. This feudal farmland was guarded by 3 sentinels. 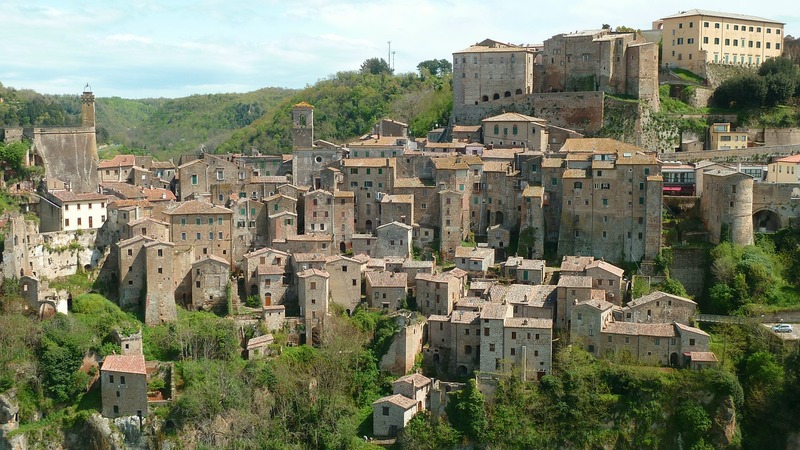 Pitigliano, Sovana, and Sorano. 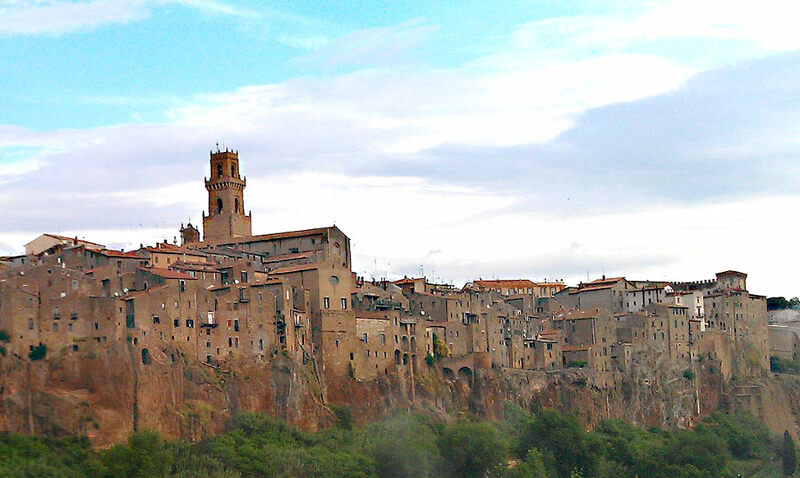 Tuscan hilltowns, built on Etruscan foundations, and carved out of ‘tufeo’ stone. From a distance, what appears to be a cliff on top of a hill, is from closer the walls of a town, with battlements and a tower. When I first came here I thought it looked sombre, weighed down by history. But the opposite is true. It was built to protect the people and it succeeded. The people here are so happy. Once they wanted to keep out the world, now the world is welcomed with open arms, plenty of smiles. You feel like long lost family returning - the welcome is that warm. I guess it helps that tourist numbers here are still manageable and hopefully it stays like that. I wouldn't want those smiles to turn into anger and anxiety as has happened with many locals on the Cinque Terre and in Venice. When in a fortress, stay in the castle. It has the best views, naturally. Chistiano taught me that. The owner of Hotel Della Fortezza epitomises that happy person I just described. Hotel Della Fortezza is in the Orsini Fortezza, the bigger of the 2 castles here. The rooms are old, but newly appointed. The stone is original, reflecting how Tuscan architects met the ‘tufeo.’ Breakfast serves in the courtyard. And like the dinner in the restaurant it is divine. La Crisalide: is a 2 bedroomed apartment inside the centro storico. Simple, comfy and terraced. When you’re on the street, looking up at a balcony, and you wonder what it's like to live in this town, well La Crisalde gives you a fair approximation of what life as a local would be like; with the full set of benefits. If it’s full in summer, book in winter. 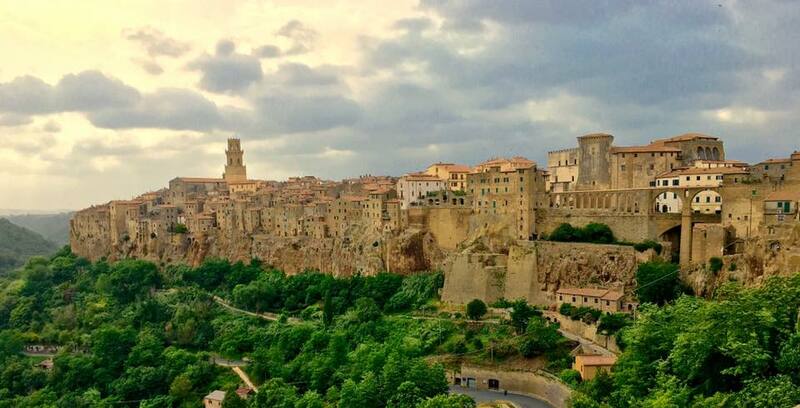 Sorano is just as vibrant then. Poderone Vecchio opens you to the country. It’s quiet, feels blissfully removed, and is only 2 miles out. You’re connected via WiFi so pack your phone and share your pics. I’d love to see how you view these towns. This produce was protected for a reason. The only way to appreciate the Tuscan farm egg, for instance, as presented at Agriturismo Le Gore, which is just outside Sorano, starts with getting on a plane to Tuscany. Eating in the centro storico, when the handmade pasta at Fidalma is put in front of me, with my mushrooms, cream and herbs, I close my eyes, smell the steam, do a mental jig and tuck in, while dipping into the town’s ubiquitous tipple, Sorano red. The Antipasti at Hosteria`del Borgo can just keep on coming - forget the next course- this is the perfect meal. Wherever you do choose to eat make sure you allow 2 hours for lunch, and don't be tempted by habits from home to rush - take hours . This is ‘slow food’ on location. Centro storico: Visit shops, wander alleyways, listen to stories, have an espresso. Relax. Take a load off. Be happy. Orsini Fortezza. From here invaders were seen, prepared for and repelled. Here is where people knelt and thanked the Madonna; and where prayer was expressed as art. Visit a cellar, drink the wine: Try Locanda Aldobrandeschi, in the ghetto. You come to realize how deep the Tuscan vine grows. Porta di Sopra (gate): for a) architecture, c) piazza, and c) the view. The Lecce river is a lovely thing. Synagogue: is proof once again that belief in God inspires great things. The biggest of the towns. From the Casa del Ghetto, as I experienced it, the synagogue is most central and was in the the ghetto. Orsini Palace was just outside. Palace and ghetto were a stone’s throw away. This is a vibey hub and a place of trade, as it was in the old days, and as is reflected by the shops today. Forget Versace, come shop in Pitigliano. People here walk around in style. It’s cosmopolitan. Not Milan, but not typical country village either. Here there is a night-life. The restaurants buzz, the music plays. People live close together here, and gather often. Passeggiata commences, the skies deepen, Pitigliano lights up, and things get genteelly hedonistic. Locanda Il Tufo Rosa is just outside the centro storico, in the palace. The one extends from the other so the whole place abounds with art, relics, and artifacts. If rooms are small. It’s how they were built. Casa Messi is also in the centre. 2 bedroomed, so a good family choice: the fireplace, and that Pitigliano feel, make this another cozy stay. Spas are not why I come to Tuscany. I come for reasons of food and love. Agriturismo Airone has a spa, but I prefer their omelettes. Street food is served in Pitigliano by the plateful; those plates are brought out to terraces by hurried waiters, wine is served. There is much going on, so many dishes. The Gorgonzola and pear pizza placed in front of me at Locanda del Pozzo Antico was devoured and remembered long afterwards. A lamb shank at Agriturismo Airone, along with a garden salad, fresh italian bread, the local provelone and olive oil. These tomatoes aren’t the ones in the NY suparette. Torciata festival: A line of men carry lighted torches into the main square, then burn an effigy, evocatively done. Duomo: The tower is a must see, if just for the spectacular views. Via Cave: The Etruscan roads make interesting walking. Aqueduct: built by the Medicis it is my favorite design feature. There is no train line, but buses do come from Grossetto with links to Sorano. A car is a good call.